Olimp L-Carnitine Xplode is a dietary supplement that contains L-carnitine (in the form of tartrate), enriched with magnesium and vitamin B6. The product supports the reduction of excess body fat and helps maintain normal mental and motor functions. L-carnitine is an endogenous, biologically active vitamin-like substance that plays a very important role in the human body. In some quantities it is produced in the kidneys, liver and brain, but its highest concentration is observed in the heart and skeletal muscles. It is synthesized from 2 amino acids - methionine and lysine, however, to the production of L-carnitine the iron and vitamins (vitamin C, vitamin B6 and niacin) are also necessary. Their deficiency may be one of the causes of insufficient endogenous L-carnitine production. L-carnitine owes its popularity , because it supports the weight loss, which is related to its role in beta-oxidation of fatty acids. In addition, this substance is involved in the metabolism of amino acids, increases tolerance to the physical exercise, eliminates fatigue and promotes post-workout recovery (affects the reduction of lactic acid). The biologically active L-carnitine in the form of tartrate (a combination of carnitine and tartaric acid) is characterized by a higher durability and is much better absorbable by the body. Vitamin B6 (pyridoxine) - a water-soluble vitamin, involved in a number of metabolic processes. This substance determines the proper transformation of fats and carbohydrates, as well as supports the nervous system and enables the proper management of the energy obtained from food. As mentioned before, vitamin B6 is also necessary for the synthesis of L-carnitine, which in combination with the aforementioned properties confirms the synergy of action of these two substances. Magnesium is an intracellular cation that is involved in the activation of over 300 enzymes. This element shows a synergy of action with L-carnitine, especially in the area of nervous and muscular system support and cardioprotection. L-carnitine supports the transport of long-chain fatty acids through the mitochondrial membrane. A beta-oxidation process takes place in the mitochondria. Thanks to it, lipid metabolism is regulated and the formation of adipose tissue is limited, also the energy necessary for the optimal functioning of the body is released (in other words - fat is converted into energy). Furthermore, L-carnitine acts as a transporter not only for long chains of fatty acids - it also takes part in the removal of short- and medium-chain fractions, which in excess may have a cytotoxic effect. It was also shown that L-carnitine can lower triglycerides and cholesterol levels and also its important role in the thermogenesis process was indicated. L-carnitine affects the proper acetyl-CoA ratio to CoA. As a result, it indirectly contributes to the increase of CoA availability needed for the oxidative decarboxylation of pyruvate, which positively influences the course of the Krebs cycle. Thus, L-carnitine enhances the body's exercise capacity - lowers the level of lactic acid and helps to increase VO2max. L-carnitine has the ability to neutralize the reactive forms of oxygen and their derivatives, as well as to the chelation of some heavy metals (for instance lead or cadmium). Due to the fact that this substance reduces the number of oxidative damage, it plays an invaluable role in the stabilization of cell membranes and promotes the proper functioning of ion channels. 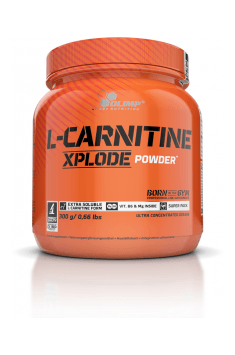 In summary, Olimp L-Carnitine Xplode is a dietary supplement recommended in particular to the athletes, people exercising recreationally, and people who are slimming. It can also be a support in the fight against the persistent fatigue and weakness. The applied form of L-carnitine l-tartrate guarantees high absorbability of the preparation, and the addition of magnesium and vitamin B6 enhances the benefits of supplementing this substance. Take 1 portion a day before training. Dissolve 1 portion (3g = 1 scoop) in 130 ml of water. Use immedtaely after preparation. On non-training days, you may skip taking the product. The application and the daily dose of L-carnitine depends on its form. The most common are: L- acetylcarnitine (ALCAR), glycine propionyl-L-carnitine (GPLC) and the present in the preparation - L-carnitine l-tartrate (LCLT). The standard dose for this form is from 1000 to 4000 mg. In order to reduce body weight, the effects are usually seen with about 2g of L-carnitine per day, which means that the dose used in this preparation is sufficient. Aromas, maltodextrin, dye - E 150d (for all kinds of cola flavors); anti-caking agent - silicon dioxide; sweeteners - acesulfame K, sucralose; acidity regulator - citric acid; colors: carotenes (A), cochineal (B), riboflavin (C), E 150c (D), E 150d (E), E 133 (F), patent blue V (G), indigo carmine (H), chlorophylls and chlorophyllins (I), curcumin (J), anthocyanins (K), pepper extract (L), betanin (M), vegetable carbon (N). (A) - (Z) - Depending on the taste of the product, the symbol (A-Z) of the ingredient used is next to the date of minimum durability.